Garden Notebook – Caramel & Guacamole | Faddegon's Nursery, Inc.
May 12, 2017 | Garden Tips, Perennials, What's New? I love heuchera (also known as Coral Bells). 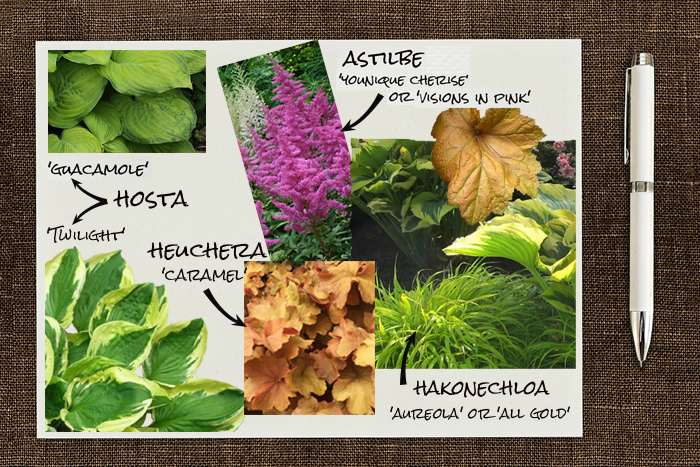 Just like hosta, the number of varieties grows fast and with that comes an absolute smorgasbord of plants to choose from. Still, ‘Caramel’ remains one of my favorites. It glows a wonderful range of apricots and ambers with creamy white flowers appearing in spring but you’ll definitely want it for the foliage. It’s a compact variety that spreads a little wider than it is tall. Better in part shade than full shade. ‘Younique Cherise’ is a shorter astilbe and will look precious with ‘Caramel’ heuchera! It will bloom out in early summer and continue to mid-summer. Both are compact varieties so they look right together. This astilbe is known for its abundance of blooms that leave the foliage behind! For a taller and paler pink flower take a look at ‘Visions in Pink’ astilbe which tops out at about 20″. It also blooms in mid-summer rather than early. It’s really misleading to give you two hosta varieties to look at. There are so many! For this design, the only real piece of advice is that the blue hostas won’t give you as bright or “sunny” a look. I just love the two toned beauty of ‘Guacamole’ so even though it’s a bit bigger I was careful to give it room. Avocado green leaves with darker green margins are so pleasing. ‘Twilight’ is another hot contender for this spot if you like a lighter margin and a smaller hosta (10″ tall). Both ‘Guacamole’ and ‘Twilight’ bloom in midsummer so they’ll pick up where the astilbe left off. You can also take a look at ‘Island Breeze’ for reverse coloration, Shadowland ‘Autumn Frost’, or ‘Royal Wedding’. Anyone who has either of these Japanese forest grasses will tell you that they bring such fabulous texture to the garden that they make any plant nearby look better! ‘All Gold’ has that lime/yellow color that lights up while ‘Aureola’ is more of an avocado green. The choice is based on color and the size difference. ‘All Gold’ can grow to 2′ while ‘Aureola’ grows to 12-18″ and may work better with this design. If you’re in love with ‘All Gold’s” color be careful not to let it crowd out ‘Caramel’ and ‘Younque Cherise’!